After his 220 days in solitary confinement, under harsh interrogations, Branch 26 of the Revolutionary Court, presided by Judge Pirabbasi, has sentenced Former MP and former governor of Karaj, Mir Taher Mousavi, to five years imprisonment and ten years forced exile in Baluchestan. Mir Taher Mousavi, a Professor of Sociology, former Parliament member, former Governor of Karaj, and a member of Mir Hossein Mousavi’s 2009 presidential campaign, was arrested last July and was transferred to solitary confinement in the Intelligence Ministry’s Ward at Evin prison. Previously Kalameh had reported that the interrogators had given him two options: 1) A Commander Madhi-style interview as was broadcast on Zarghami’s Sima TV (Seda Va Sima, the Iranian national broadcast system), or; 2)A confession in a show trial like those we witnessed in the show trials of 2009. Kalameh has also previously reported that Mir Taher Mousavi was under severe pressure to give a false confession. In particular, he was under heavy pressure to give an on camera confession. There is no information at hand indicating whether or not his tortures included any physical torture. But, certainly it is indisputable that solitary confinement in itself is a form of torture, and, in Mir Taher Mousavi’s case, psychological pressure and his illness are additives. Mir Taher Mousavi suffers from various illnesses, including a heart condition, and was under physicians care prior to his arrest. Doctors treating him had said, by no means should he be kept in isolation and confined to a closed environment. Despite Mousavi’s family having relayed the physicians opinion to prison officials and the investigators, Mousavi continues to be confined in solitary in Evin Ward 209. Despite news sites close to the Intelligence apparatuses reporting of a heavy judgement against Mousavi, he has not as yet been officially notified of his sentence. He is one of the harshest critics of president Mahmoud Ahmadinejad for which he has been imprisoned several times. Mehdi Khazali is the son of the hard-line cleric member of the Assembly of Experts Ayatollah Khazali. After the public criticism of Ahmadinejad by his son, Ayatollah Khazali publicly denounced and distanced himself from his son’s positions. On October 13, 2010, Mehdi Khazali was once again arrested by Intelligence Ministry’s agents after being summoned to the Branch 4 of the Public Prosecutor’s office at the Revolutionary Court. On that same day he had been threatened by the security police that he must present himself at Evin. Khazali was once again incarcerated in Evin prison. 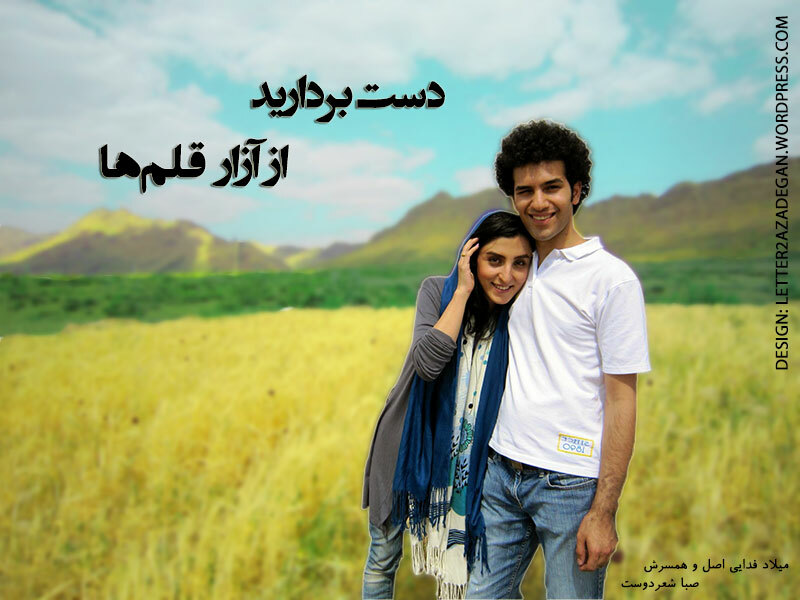 His charges in this case were, “Insulting Ayatollah Janati, Insulting the president and propaganda against the regime”. After Mehdi Khazali continued with his critical writings on his blog, he was once again summoned and arrested on July 18, 2011. He launched a hunger strike from day one of this arrest. 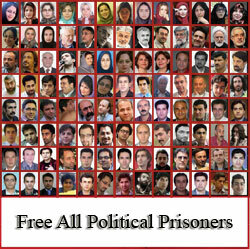 He was transferred to Ward 350 in Evin prison on August 8, 2011. Dr. Khazali suffered various health problems and was taken to Evin clinic on the 35th day of his hunger strike due to deteriorating health condition. Dr. Khazali was released from prison early morning hours of March 19, 2012 after 70 days of hunger strike and having lost about 66 lbs, frail and unable to walk without using a case. On February 5, 2012, Khazali was sentenced by Branch 26 of the Revolutionary court to 14 years in prison, 10 years exile and 90 lashes. He was charged with “Propaganda against the regime, assembly and collusion with intent to act against the national security, and writing of critical letters to the Supreme Leader”. This sentence was issued for his previous cases. Dr. Mehdi Khazali was among dozens of people arrested Tuesday night October 30, 2012 in a raid of the Writers Society meeting. Upon arrest he announced he will launch a dry hunger strike. Dr. Khazali broke his hunger strike after 12 days with the interrogators promising to release the other people who were arrested with him at the Writers Society meeting. 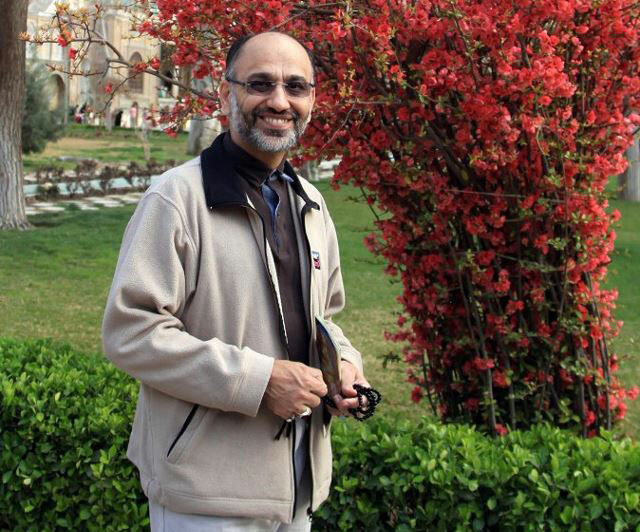 After 40 days of no news and no contact with family, on December 8, 2012 Dr. Khazali was allowed to phone his family. Despite bail having been set for the release of Dr. Khazali on December 30, 2012, his family was not notified of the judge’s order until February 16, 2013. Dr. Khazali’s family provided the court ordered bail, however, Intelligence Ministry prevented his release & pressed new charges. Dr. Khazali is being kept in prison illegally. He has vowed to remain on hunger strike until he is released from his illegal imprisonment. While in the past months, the Intelligence apparatuses were trying to encourage the Reformists (in a controlled and ineffective manner) to participate in the upcoming presidential election, yet, a large number of activists have recently been summoned and threatened that they should refrain from any campaign activities. Otherwise, they should expect to be arrested, and more seriously confronted. According to Kalameh, reports indicate that, in the past few days, a large number of Reformist political activists and critics, a number of university educators, civil activists, labor and union activists, student activists, ethnic activists, Dervishes and Sunnis have been summoned in various cities across the country, by the Intelligence Ministry and the IRGC Intelligence and were given warnings (on behalf of the establishment, they were told) by the intelligence officials. Kalameh also reports that the homes of many of the people summoned were searched and, in some cases, property and documents were confiscated. In the extensive search of the homes, even the religious and academic papers and pamphlets were carefully examined. The intelligence agencies have informed the Reformist activists that, for the upcoming ’92 elections (2013), the establishment (read the authoritarian ruler) has made a final decision to prevent the effective participation of Reformists and Green Movement supporters in the election. Further, that any effort made towards involvement in the election will strongly be confronted. They have also warned most of the people summoned, not to even think about the presence of someone like Khatami (former president) in the election, because according to them, the ruling establishment is against the candidacy of Mohamad Khatami. The Analysis of some of the people summoned is that the purpose for these summons, and this method of confrontation, is to push from the scene the critical Reformist forces by threats and security management. This will keep the establishment from paying any cost for the possible disqualification of the Reformist candidate, of fraudulent election results, or from being forced to accept a person critical of the current situation in the presidency seat. Even though, just last night (January 27, 2013), they arrested a few of your colleagues, or you may have heard about some of your colleagues having been summoned and interrogated…..You may be at work, they come for you. As simple as that: From today, no more job; from today, your home becomes another prison cell. For days, all they thought about was to complete the furnishing of their home. At the beginning of Spring, they are suppose to start their lives under the same roof, and they are very excited. Early in the morning, the phone rang, it was Saba. I wondered, at this time of the day? With a bit of hesitation, I answered, thinking she may have been upset because we didn’t go over last night…..I said, “Hello, how are you.” I was shocked to hear her cry. These words were written by Mahdieh Golro (A former political prisoner) on her Facebook page about her friend Saba Sherdoost, the wife of journalist Millad Fadaei (political editor at Ilna). But when Mahdiyeh erroneously (and according to herself not paying enough attention) wrote the name of Saba Azarpaik instead of Saba Seerdoost, she didn’t know that in a few hours it would be Saba Azarpaik’s turn also. Today they arrested Saba Azarpaik, perhaps they wanted to retaliate over a lot of things! 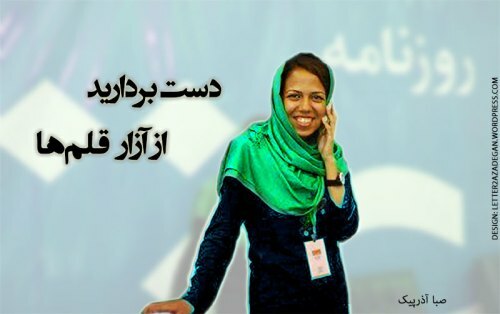 Like, to retaliate for her pursuing the case of Sattar Beheshti (the blogger who died in detention). Or, retaliation for her sorrow filled report from Robatkarim (where Sattar was buried) and of his mournful mother and sister. Now that they have arrested these journalists, perhaps they want to avenge drop-by-drop the ink that flowed from their pens. But they have a great illusion, an extremely groundless and flimsy illusion. Yes, Sunday January 27, 2013 will be known as the day that the oppressor blackened and scratched it’s history page with it’s claws. But one day in the future when people read these pages, nothing will reach their eyes, except the light from the new growth, pure as white. Although it may appear that the new growth has been enchained by the oppressor, it’s light will remain. An oppressor who leaves marks on it’s own face, by it’s own claws and will eventually give itself the gift of darkness and destruction!….